While the fictional Marvel Universe has Tony Stark, there is a real-world equivalent: Elon Musk. In fact, after Time Magazine named Musk in its ‘Time 100 List of 2010’, the director of the Iron Man film, Jon Favreau, claimed that Stark’s character was based on Elon Musk. This wealthy tech enthusiast, entrepreneur and philanthropist has a net worth of close to $20 billion today, and he has been known to spend his fortune on bizarre and outlandish projects. Musk’s serial entrepreneur style and his love for moonshot investments may not be everyone’s cup of tea. The fact that he so often succeeds which initially appeared implausible or impossible, is what makes him so special, and the reason many people consider him a visionary. After he obtained his bachelor’s degree from the University of Pennsylvania, Musk enrolled in a graduate course in physics at Stanford University but dropped out after only two days. He believed the Internet had much more potential to bring about change. He then founded Zip2, a provider of online maps and business directories. The company was acquired by Compaq in 1999 for $307 million. Musk would go on to start an online financial services company, which was initially known as X.com but he later changed its name to PayPal to reflect its focus on online money transfers and payments. Today, PayPal is the undisputed leader in online money transfers and is the preferred method of payment accepted at major e-commerce websites and retailers. For a long time, Musk had always been fascinated by the potential of electric cars. In 2004, he provided the majority of funding for Tesla Motors (which would later be renamed Tesla), a company founded by Marc Tarpenning and Martin Eberhard to produce electric cars. Tesla released its first car, the Roadster in 2006. The Tesla Model S sedan was then introduced two years later to much acclaim by the auto industry due to its high performance and innovative design. Tesla would go on to release the Model X SUV in 2015, and the less-expensive Model 3 in 2017. Musk is credited with coming up with many of the innovative ideas that his team at Tesla have brought to life. For long, Musk has held the conviction that, if life is to survive, humanity needs to become a multi-planetary species. However, Elon was disappointed with the huge cost of building and operating the existing rocket launchers. As a result, he launched a new company known as Space Exploration Technologies (SpaceX), with the explicit mandate to build more affordable rockets. In 2018 Elon Musk’s company became the first privately-owned aerospace firm to launch a car into space. Why did he do it? Simple – to show that he could! SpaceX’s Falcon Heavy – the world’s most powerful rocket – put the vehicle (a Tesla, naturally) into orbit above the earth. Not happy with the projected $68 billion cost of a proposed high-speed rail link in California, Musk put forward a proposal for an alternative. Known as the Hyperloop, it would be a pneumatic tube containing a pod capable of moving 28 passengers from Los Angeles to San Francisco – a distance of 350 miles – in just 35 minutes. The Hyperloop’s top speed would be 760 miles per hour (1,220 kilometres per hour), which is nearly the speed of sound. In addition, Musk said that the cost of the Hyperloop system would be only $6 billion. Since the transportation pods would depart from their stations at intervals of two minutes, the system would easily accommodate the six million people who journey on the LA-San Francisco route each year. 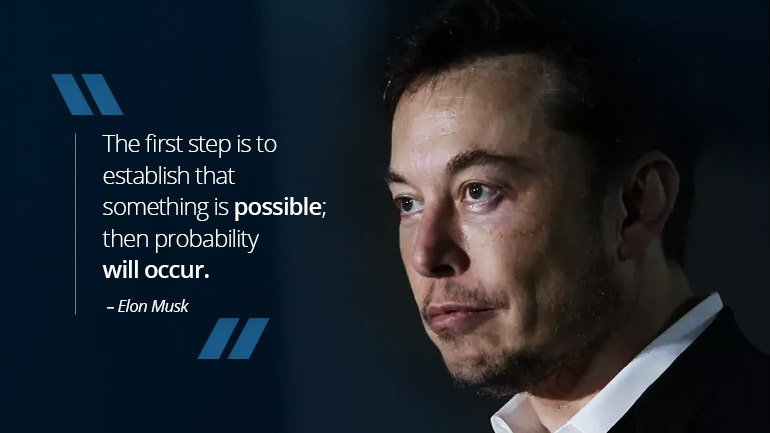 It is evident that Elon Musk is one of the great minds of the century and clearly, his unique and innovative ideas are leading the way into the future!